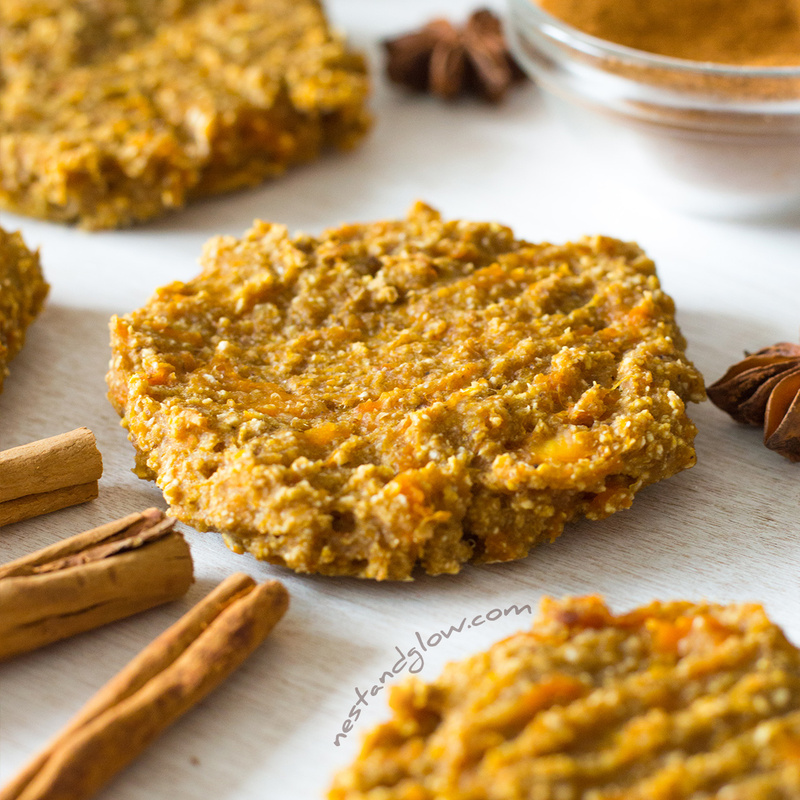 Healthy pumpkin spice cookies with no sugar and made from oatmeal. 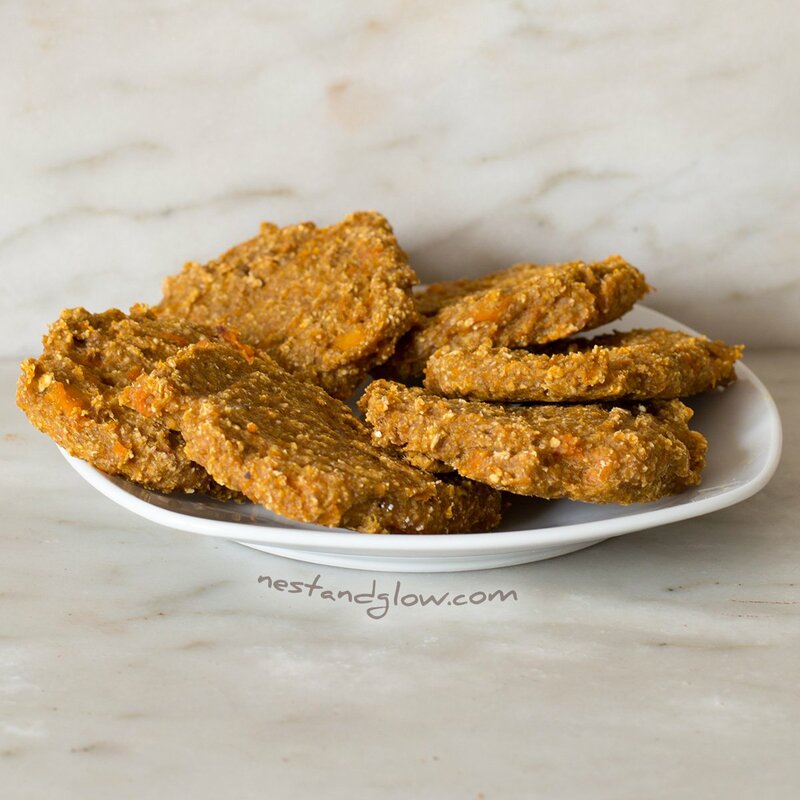 Suitable for wheat-free, vegan, nut free and general healthy diets. Low in sugar and can be sweetened with applesauce. This recipe takes a few minutes of prep work and the baking is virtually foolproof. The perfect on the go breakfast for a cold autumn morning. 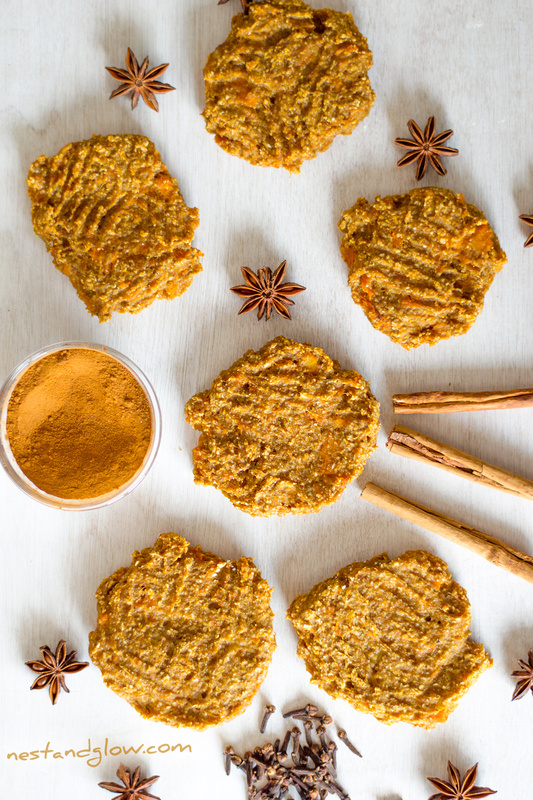 Loaded with vitamins and minerals from bananas, pumpkin, turmeric, ginger and cinnamon. Adjust the spices to suit your tastes and top with your favourite frosting for more indulgence, see below for some frosting ideas. I use dry roasted pumpkin for this recipe – just peel and deseed the pumpkin. Then cut into cubes and bake in the oven until it starts to go golden. See the pumpkin spice latte for more information on cooking the pumpkin. I tend to cook a whole pumpkin at a time then mash and store in the fridge to use for various recipes. Roasted pumpkin gives the best flavour as when you boil or steam pumpkin it becomes watery. Roasting intensifies the flavour and makes the natural pumpkin sugars caramelise. This is a great recipe to use up really ripe and soft bananas. The browner the banana skin the better as they will be sweeter and easier to mash. If you can’t get hold of pumpkin where you are then cooked butternut squash works just as well. If you’re using canned pumpkin then try to choose a brand without added sugar as this is a healthy recipe. 80% of people with celiac disease can eat oats if they are gluten-free. 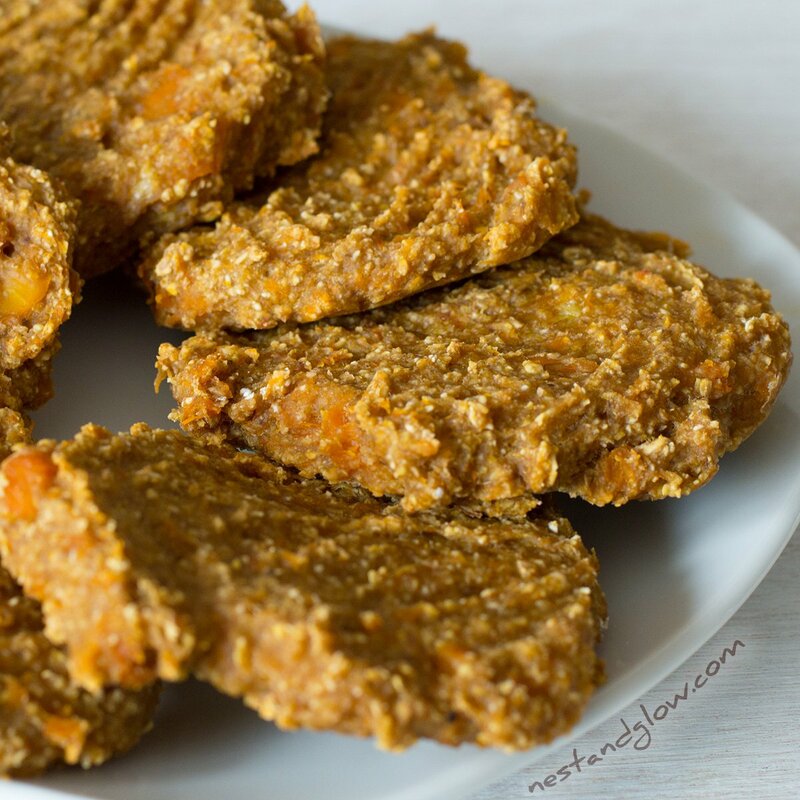 If you are making these for a celiac then check that they don’t have a reaction to gluten-free oats. Gluten free oats are made by processing oats in a factory where they are not contaminated with tiny particles of gluten from other grains. If you are following a gluten-free diet these are suitable. If you want to have these frosted then I highly recommend the cashew vanilla icing or the concentrate from the cashew pumpkin latte if you really want a full on pumpkin spice flavour! 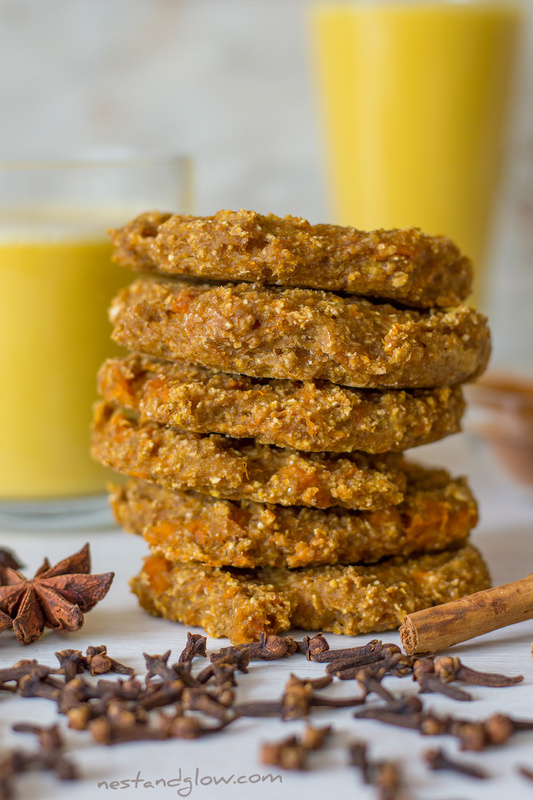 The cookie in the photo above is topped with the concentrate from the pumpkin latte. Five spice contains cloves, cinnamon, star anise, Sichuan pepper and fennel. It’s sometimes called Chinese five spice and can contain more spices than the base 5. 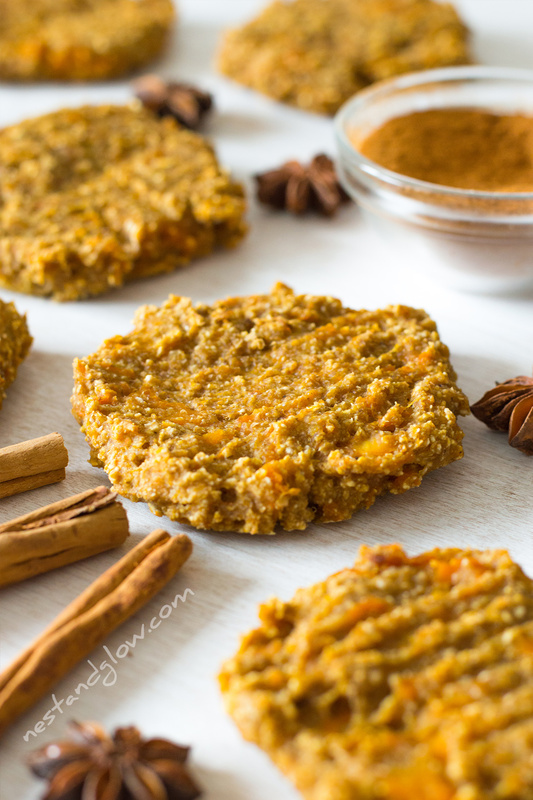 These cookies are naturally sweetened by just the banana and pumpkin with no added sugar. Healthy cookies are the kind that you can eat a whole plate of and still feel good. If you don’t want to use banana you can replace with sweet potato and applesauce. Grind the oats in a coffee grinder or small bullet blender. Mash the bananas and pumpkin together. Mix everything together to make your cookie dough. Spoon on the cookie dough onto a non-stick surface. Bake for about 20 mins until golden. Eat straight away or they can be stored in the fridge for about 3 days. Look really healthy and yummy! I don’t like banana so will try your sweet potato method. Should I cook the sweet potato first, how much to use? Hi Jan, I would use sweet potato that’s about the same volume of two bananas. You do want to cook it first – I would bake it as steaming or boiling makes it watery. Let me know how it turns out! Can we have one ? It just look ultra delicious 😀 We have to try out this recipe, what a piece of heaven! 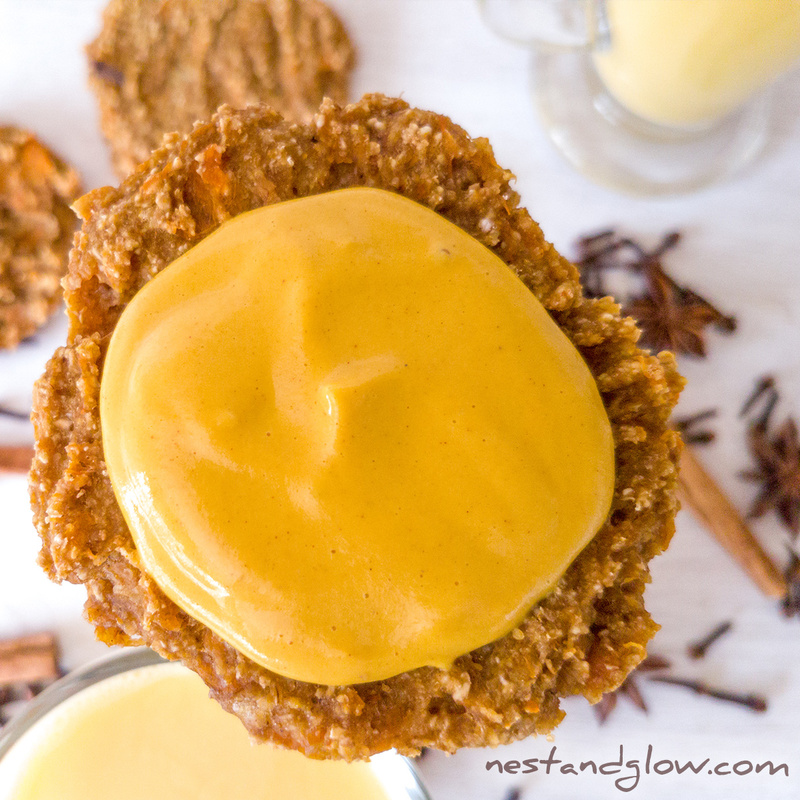 I’ve not made these but they look amazing and so easy to make thanks again nest! I’ve made this recipe twice, the first time I felt they needed more spice so added a bit more of everything and they were perfect! This is going to become one of my fave recipes to do in fall. Its healthy but also a bit of a treat. These were terrible. Gives “healthy” a bad name! Doughy and tasteless. Would not recommend. Followed directions exactly only baked an additional few minutes trying to save them. Hi Jacqueline, I’m really sad to hear that. As with all my recipes they are high in natural produce so you really need to make sure you use pumpkin / bananas that are full of taste and flavour. Also some spices can lose their flavour if they are old. I would up the spices and make with pumpkins and bananas that are really ripe and sweet. Lots have enjoyed this recipe but it’s difficult for it to go right every single time with so much natural variation. Give it another try and report back! I have just made these. Mine are stodgy like a malt loaf texture. Have i cooked them for long enough? Very good. I used not overripe bananas, almond flour instead of oat, I added a touch of erythritrol, pecans and mini chocolate chips to lean to my favor. 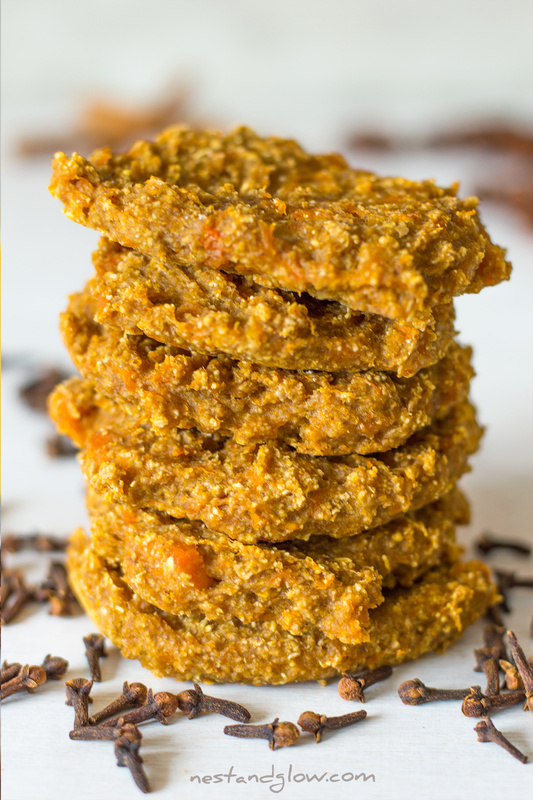 Healthy alternative to carb rich cookies and fast. Thank you for recipe and inspiration!! Just started looking for lower carb, cholesterol etc cookie recipes and happened to have had a can of pumpkin in the pantry so tired these and am pretty amazed at the great flavor ! Will make the Cashew Vanilla frosting to try on them tonight 🙂 Thank you for sharing these ! Thanks so much, glad you like these pumpkin cookies!